Want to help others experience the same thrill you get from high performance driving at track days? 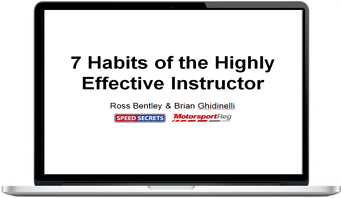 Listen in as Ross Bentley, driving coach, instructor and author of Brake, Brake, BRAKE: The HPDE Instructor Manifesto, and Brian Ghidinelli, HPDE instructor, racer and founder of MotorsportReg.com, explain the 7 habits of highly effective track day driving instructors. In this free 60-minute webinar (plus 30 bonus minutes of Q&A) you'll learn 7 tips you can start using in the right-hand seat TODAY! TrackDayTire.com offers sponsored driver pricing on Hoosier tires to HPDE instructors as a thank you for your contribution to our sport. Apply online at TrackDayTire.com. Driving tips, track-specific advice, car setup information, mental prep strategies and other resources, opinions and stories delivered to your inbox. Sign up to receive invitations to instruct at local events when an organization is looking for extra help. After logging into your MSR account, click on Edit my information and then choose Mailing Lists. Ever considered running your own track event? Our free ebook will help get you started!